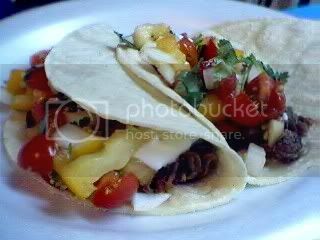 This is the beef tacos we made tonight, from left over roast beef made a couple of nights ago. The salsa, we made from tomatoes from our garden. This year we planted red and yellow tomatoes. I think it makes for a pretty colorful salsa. We had Spanish rice with the tacos. I also made tortilla chips and crispy taco shells, but those got eaten up before I could photograph it. This was my plate, I prefer soft tacos. I think it tastes better, and it cuts out on the fat from frying. There’s no recipe for this dish, it’s pretty straight forward. Just assemble your meat, salsa and if you choose, sour cream inside the tortilla, and you’re good to go. Salsa – tomatoes, onions, jalapeno peppers, & cilantro. Add lemon or lime juice, salt & pepper to taste.